After hours of juggling a wailing baby, you’re probably desperate to address teething pain. 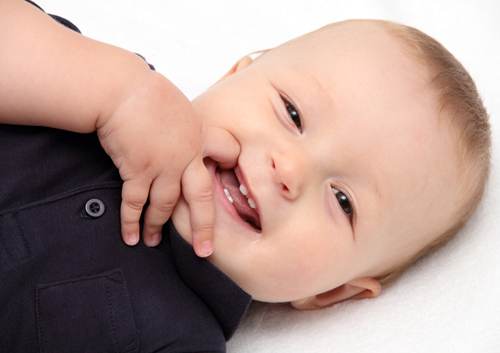 If your baby is irritable, drooling, and chewing on hard objects, he or she is likely teething. Although some discomfort while your baby is teething is inevitable, learning a few basic approaches can ease painful gums and soothe your frazzled nerves. Offer your finger. Simply chewing on your nice, plump finger may be enough to ease your little one’s pain. Make sure you clean your finger before placing it in your baby’s mouth. Use a teething ring. A firm rubber teething ring allows your child to gnaw, and alleviates pain. If your baby seems to like sucking on a bottle, replace the milk or formula with water during teething periods. This reduces sugar intake and decreases the risk of tooth decay. Cool it down. Stick a clean, moist washcloth in the freezer (place it on a tray for cleanliness) and offer that to your baby. The cooler temperature of the chilled cloth eases the pain of teeth erupting through the gums. Soaking the washcloth in non-caffeinated tea, such as chamomile, may reduce inflammation associated with teething. Grab some hard foods. Certain foods allow your kiddo to gnaw, and can ease teething pain. For example, frozen bananas, large chunks of chilled carrots, an apple, or frozen bagels make good teething pain relievers. If you’re offering your child solid food, watch carefully to ensure that your infant doesn’t bite off a piece and choke. Try a natural remedy. Years of grandmotherly wisdom suggest that home remedies might help with teething. Try rubbing clove oil, peeled ginger root, or vanilla extract onto your child’s gums. Although there isn’t scientific evidence to prove these remedies are effective, they may help your little one through the painful teething process. Just remember to test the method out on your own gums first to ensure any tingling or numbing is bearable for your child. Use medications. If your baby seems to be especially uncomfortable, over-the-counter medications may be appropriate. Giving an age-appropriate dose of acetaminophen (Tylenol) or ibuprofen (Advil) may reduce discomfort. Make sure you check with your child’s pediatrician or our office first to ensure the medication is safe. If nothing seems to be helping your child’s teething pain, you can always schedule an appointment with Dr. Varble, Dr. Applebaum, Dr. Dill and Dr. Wong. Our team at SmileKidz understands the unique health needs of your little one, and are more than happy to help ensure he or she grows up with a beautiful smile. For more information about teething, or to schedule an appointment with Dr. Varble, Dr. Applebaum, Dr. Dill and Dr. Wong, please give us a call at our convenient Creve Coeur, MO and St. Charles, MO office today!